Retro design and intuitive operation, perfect for everyday use. 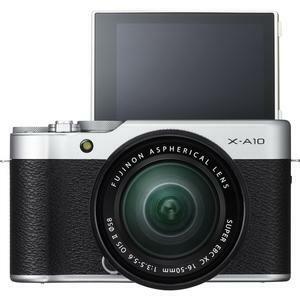 Compact and lightweight by design, the Fujifilm X-A10 Wi-Fi Digital Camera combines retro design with intuitive operability. 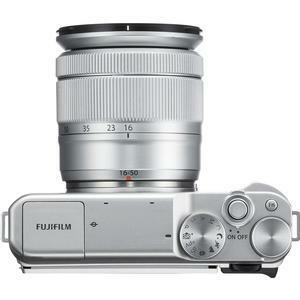 The X-A10's 16.3 megapixel APS-C sensor with image processing engine achieves Fujifilm's excellent photo quality. Sharp FUJINON lenses that boast ultimate image resolution, and the proprietary color-reproduction technology, refined over more than 80 years, allows users to capture premium quality images in any shooting conditions. 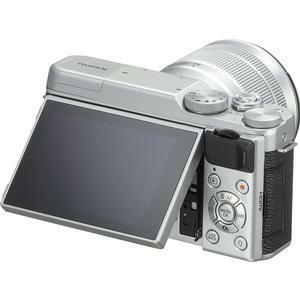 User friendly features include 180-degree slide-and-tilt LCD for facilitating "self portraits", full 1080p HD video recording, a wide range of shooting modes and versatile scene positions, macro shooting from as close as 7cm, and a Super Intelligent Flash that naturally captures backgrounds. Easily back up in-camera data to your computer, and enable remote shooting from smartphones and tablet devices with built-in wireless communication. You can even attach GPS location information, obtained by your smart device, to your images. 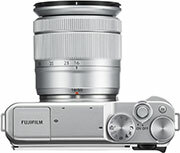 This outfit includes the FUJINON XC16-50mm F3.5-5.6 OIS II, a standard zoom lens with a focal range equivalent to 24-76mm in the 35mm film format. 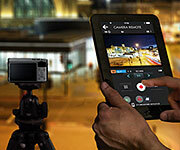 Compact and lightweight, weighing only 195g and features 3 stops of image stabilization. The minimum working distance on the wide-angle end is now 15cm and the lens barrel finish has been improved. The screen has a slide-and-tilt mechanism so when it is tilted 180 degrees into "selfie-mode", it can slide out further to ensure the camera body doesn't block the view. Rotating the tilting LCD upward by 180 degrees activates the Eye Detection AF to automatically adjust the focus on the subject's eyes. 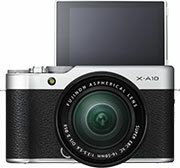 The FUJIFILM X-A10 features a Portrait Enhancer mode, which makes the human skin look smoother and brighter. Enjoy the beautiful skin tonality that only the X Series offers also when shooting selfies. 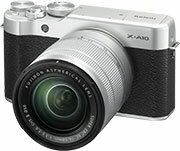 The FUJIFILM X-A10 combines a 16.3 megapixel APS-C sensor with the image processing engine that achieves Fujifilm's excellent photo quality. Sharp FUJINON lenses that boast ultimate image resolution, and the proprietary color-reproduction technology, refined over more than 80 years, allows users to capture premium quality images in any shooting conditions. Fujifilm is particularly renowned for accurately reproducing skin tones, and the FUJIFILM X-A10 is built with this advanced skin tone reproduction capability, allowing you to produce high-quality portraiture. The "CLASSIC CHROME" mode with deeper colors and rich tones has been added to the "Film Simulation" function, which gives you choices of diverse color reproductions and tonal expressions. The expanded range of modes now includes CLASSIC CHROME, which was developed to meet the demands of Fujifilm X-Photographers worldwide. Toy Camera: Create shaded borders as if you were taking a photo on a toy camera. 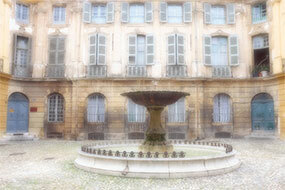 Soft Focus: Create a look that is evenly soft throughout the whole image. 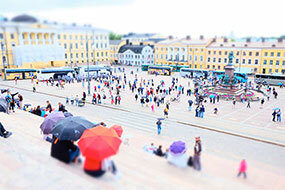 Miniature: Adds top and bottom blur for a diorama or miniature effect. Partial Color (Red/Orange/Yellow/Green/Blue/Purple): Retain one selected original color and change the rest of the photo to black and white. 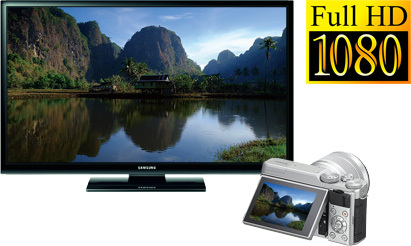 Press the dedicated Video Recording button on the rear to easily start recording full HD (1080/30p, 25p, 24p) video. The Film Simulation function, popularly used for still images, can also be applied to video recording for a diverse range of creative effects, which can be combined with smooth bokeh, made possible with the APS-C sensor and fast lens. The grip is shaped to accommodate both normal shooting and self-portraits alike. The final shape, based on ergonomic design, was decided through prototype testing involving hundreds of photographers. When taking a self-portrait, you can take photos by pressing the vertical command dial found directly below your index finger to minimize camera shake. The Self Timer function offers Smile Detection, that take photos automatically when the subject smiles, Buddy Timer which shoots when two people come close together, and Group Timer mode that automatically shoots when a specified number of people come into the frame. 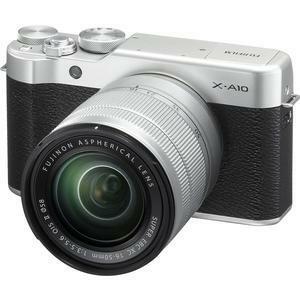 The compact and lightweight FUJIFILM X-A10 sports a retro design. The use of two Command Dials means you only need a thumb to quickly adjust aperture, shutter speed and exposure settings. 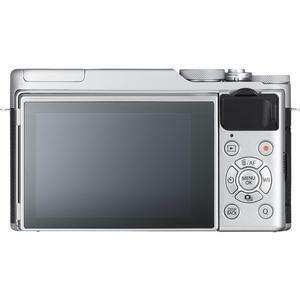 Frequently used functions such as white balance, continuous shooting and the self-timer can be assigned to standalone function buttons, eliminating the need to go through the Menu screens to change settings. 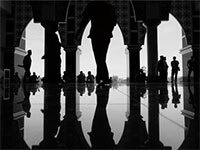 In addition to a wide range of shooting modes, the FUJIFILM X-A10 offers a selection of versatile scene positions that ensure optimum results no matter what the scene. 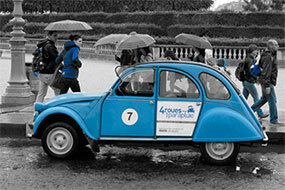 Advanced SR AUTO - Automatically optimizes shutter speed, aperture and other settings. It instantly recognizes 14 scene types and then selects the most appropriate settings. All you do is frame, press the shutter and enjoy pro-class photo quality. Scene Position - Ensures the ideal camera settings to match the shooting scenes. Frequently used Sports, Landscape, and Portrait modes can be swiftly selected with the Mode Dial. Program AE - Automatic mode to specify the settings except for the shutter speed and aperture setting. Custom - This mode is a shooting mode with user settings. 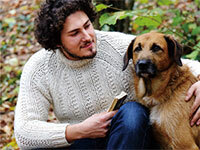 Shutter Priority AE - An automatic mode to set the shutter speed. 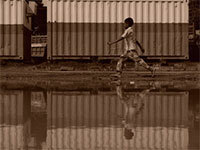 Aperture Priority AE - An automatic mode to set the aperture. 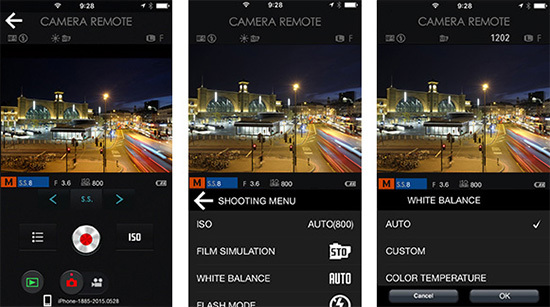 Manual - This mode provides more detailed settings that are impossible to set in Auto mode. Portrait Enhancer - For silky smooth skin tones. Sport - A quick recognition of persons in motion or objects for a faster shutter speed to help you catch the perfect moment. Night - Reduces camera shake when shooting evening and night scenes. 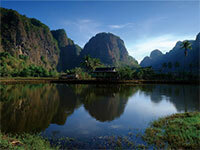 Landscape - Best for shooting scenery in daylight capturing clear and sharp shots of buildings and mountains effectively. Portrait - Set for shooting portraits. Skin tones are softened as it enhances the overall natural look. Night (Tripod) - Use a tripod and take clear shots of night scenes with a slow shutter speed. Fireworks - Effective for taking shots of fireworks with a slow shutter speed. Sunset - Capture sunset scenes which are vivid in color. Snow - Most adaptable to snow scenes without unnatural darkened images or where the whole screen appears white. Beach - Clear shots of people without darkened images under strong sunlight. 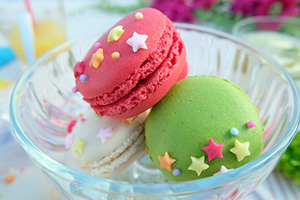 Party - Best for shooting indoor weddings or parties. Retains the natural ambiance in low-light conditions. 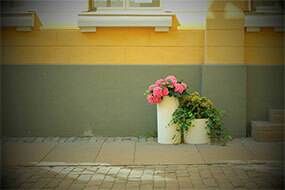 Flower - Effective for taking more vivid shots of flowers. Text - Clear shots of letters on a document or white board. With the new dedicated "FUJIFILM Camera Remote" application, you can focus and trigger the camera release from your smartphone or tablet. The app not only lets you adjust focus, but also control settings like shutter speed, aperture, exposure compensation and ISO sensitivity. You can even apply other settings like Film Simulation, self-timer, and flash while "Touch AF" lets you focus from your phone or tablet, too. Imagine all the situations where this smart assistant will come in handy! Take commemorative group photos with yourself in the shot, capture wildlife photos, or remotely release the shutter for night shots free from camera shake. The photographic possibilities are endless. Just turn on your PC and select PC AutoSave from the camera's menu for effortless wireless transfer and saving of your photos and movies to your home PC. Just download and install the free FUJIFILM Camera Remote application in your smartphone and you can set up your camera to acquire location data from your smartphone and geotag your images -- that way you'll remember exactly where they were shot. You can easily send photos directly to the instax SHARE Smartphone Printer SP-2 for great quality prints of their family, friends, pets and more. Additionally, portrait images are produced with a pleasant out-of-focus background for amazing one-of-a-kind instant prints - perfect for home decor. 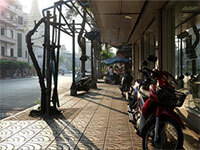 The wide-angle end of the XC16-50mm II kit lens provides a minimum working distance of approx. 7cm from lens surface. 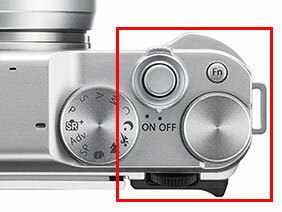 The Auto Macro function automatically switches the camera to the Macro mode for quick focusing.. The camera uses multiple focusing points to identify the intended subject, automatically selecting the subject you want to shoot.. The energy-efficient design has extended the battery life to a class-leading level, allowing you to concentrate on shooting pictures without having to worry about remaining battery power. 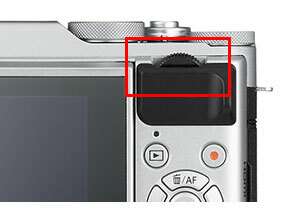 The camera also supports charging via USB for maximum convenience, especially while traveling.